Do all the counties that the tour goes to take the same type of plug? Yes and no. Most of the countries we’ll visit use the same power & receptacle style. The voltage in Europe is 240 V as compared to the 120 V we have in the US. If your appliance/item is listed as having “dual voltage” ( it will say something like 100-240 VAC), you’ll only need an adapter, and not a power converter. 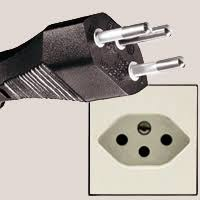 The plug in most of Europe uses two cylindrical-shaped barrel plugs instead of the flat ‘blades’ that we use here. On the left is a picture for reference. Color doesn’t matter, but you’ll want to be sure that the metal barrels AND the next 1-inch of plastic are basically in same width (i.e. 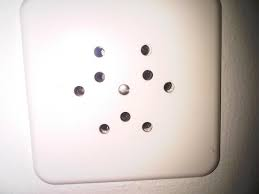 the holes are often recessed there, so if you have a big “brick” style adapter, the metal plugs might not even be able to reach the holes). On the picture to the left, two-thirds of this device will be beyond the flush surface of the wall (the metal plugs AND the next inch of plastic). If the tour visits Switzerland, the plug is a little different, and some European plug adapters work, and some don’t. If the outlet in the hotel is recessed (1st picture) the shape of of the hole may prevent your adapter from fitting. If the outlet is flush with the wall (2nd picture), the regular European adapter will work. You may want to get a “Type J” adapter just in case. IMPORTANT – if your electronic device is NOT dual-voltage, (it only says 120 V) you’ll need the adaptor AND a Power Converter (also commonly called a Transformer). You can usually purchase plug adapters/transformers at any place that sell luggage. If you have many devices that you will need to charge, bring a small American multi tap extension cord WITHOUT a surge protector (it will blow if it see’s 240 V). You can plug the extension cord into the plug adapter/power transformer, and then plug all your devices into the extension cord. That way you won’t need an adapter for every device. Additional Electronics reminders from your Directors: With communications devices, grooming, electronics, irons, etc., it’s good to work out a sharing plan with Roommates if you’ve made a roommate selection plan with the home office. ONE hair-dryer; ONE travel iron; etc. Know your phone/camera/camcorder/etc. well in advance, or plan to take the owner’s manual with you. For pictures & video, do a little research in advance. Make sure you know about resolution, memory-capacity, etc. An extra (or high-capacity) memory card, (or two! ), is probably a very wise purchase. Know how to turn off your flash!! Many locations have a mandatory no-flash rule. Ask some good questions before you leave so you’ll know some ways to still take good pictures when you have the flash off. Plan carefully for your method of carrying (and caring for) all electronics. Security is essential. We have watched some students experience heartbreak with they’ve dropped (or lost) their cameras/phones; that’s especially bad near the end of the tour when you’ve collected 2000 pictures!